(From left to right) Hyundai Heavy Industries CEO Kim Oe-hyun, Polaris Shipping chairman Han Hee-seung, KOMIPO CEO Choi Pyeong-rak and Siemens Energy Solution head Rochus Bergmann join hands after signing an MOU at Coex InterContinental Hotel in Seoul on Tuesday. 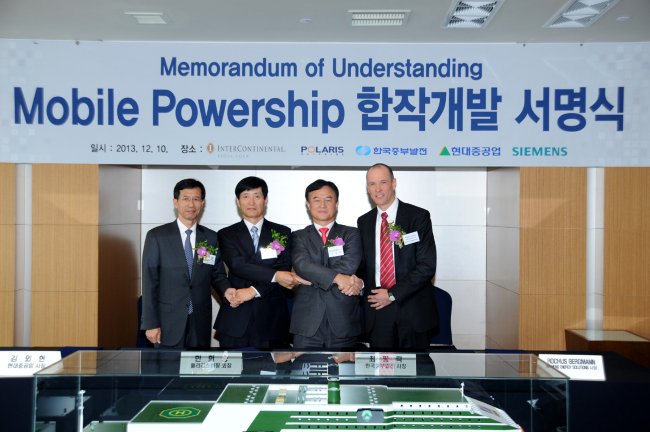 The world’s first project to build a large-scale power generation ship was launched on Tuesday in Seoul as three Korean industrial giants and German-based Siemens signed a memorandum of understanding at Coex InterContinental Hotel, companies said. Three Korean the companies joining the project are Korea Midland Power Co., Hyundai Heavy Industries and Polaris Shipping. “Simply put, the first-of-its-kind project is to build a gas-powered combined cycle power plant on a ship, not on land,’’ Kim Shin-hyung from KOMIPO said. KOMIPO will offer globally competitive know-how in power plant construction and management. Hyundai Heavy Industries, a global leading shipbuilder, will delve into building a power ship and Siemens will provide world-leading power solutions and consulting. Hyundai Heavy Industries CEO Kim Oe-hyun also expressed confidence in the project as the upcoming pilot ship is to be developed based on the FSRU that the company designed and built for the first time in the world. Based on the MOU, the four companies will launch a feasibility study and then form a joint venture firm to implement the project within the first half of next year, the consortium said. 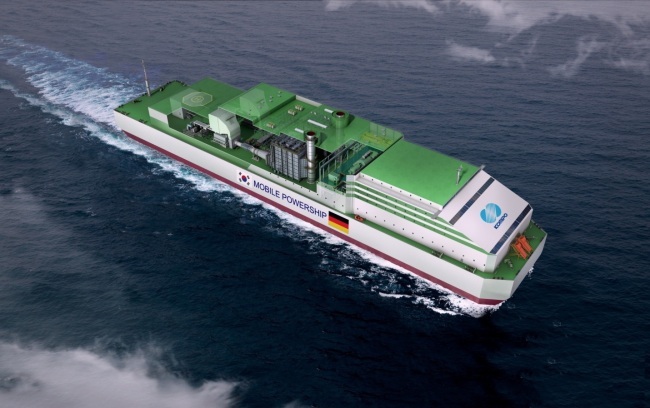 If the project goes smoothly as planned, the first mobile power ship will debut in Korea on a pilot basis in 2017. Partner firms said that depending on the ship’s performance, they could develop a follow-up project to export the new power solution overseas. Target overseas markets will include the Philippines, Indonesia, Brazil and other countries where the power rate is high and power shortages have become a critical issue. The partner firms expect that cost-saving power ships could appeal to overseas power markets since they can reduce civil complaints as they do not require large-scale sites on land and will cut costs required to install new power cables. “Ultimately, the power ship project will create a new power solution for the world,’’ Choi said.